16 inch scope up close. 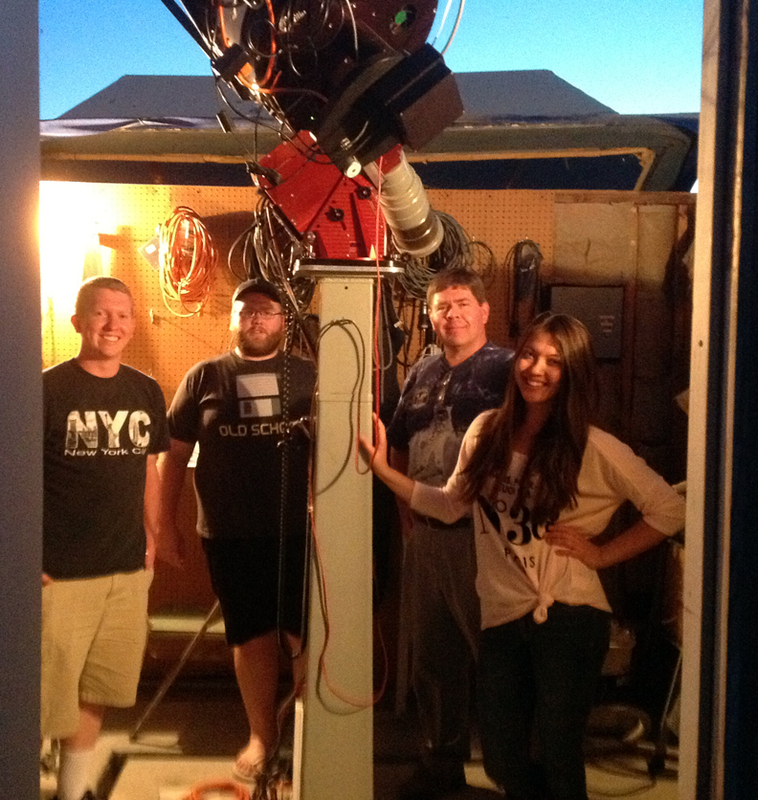 This is the automated ROVOR telescope located west of Delta, Utah. While working on my analyses of the data from open star clusters M67, NGC 752, NGC 663, and NGC 459 as part of my experience at Brigham Young University this summer, I am also preparing a group of students from Walden School of Liberal Arts for NITARP, the NASA/IPAC Teacher Archive Research Program. We’ll be traveling down to Caltech in Pasadena at the end of July to pursue an astronomy research program using the infrared data housed at IPAC (the Infrared Processing and Analysis Center). I’ve been meeting with these students each Tuesday afternoon during the summer and sharing with them what I’m doing at BYU as well as talking about our project, which will be to look for infrared excesses around K-type giants that might indicate they are consuming their own planets. 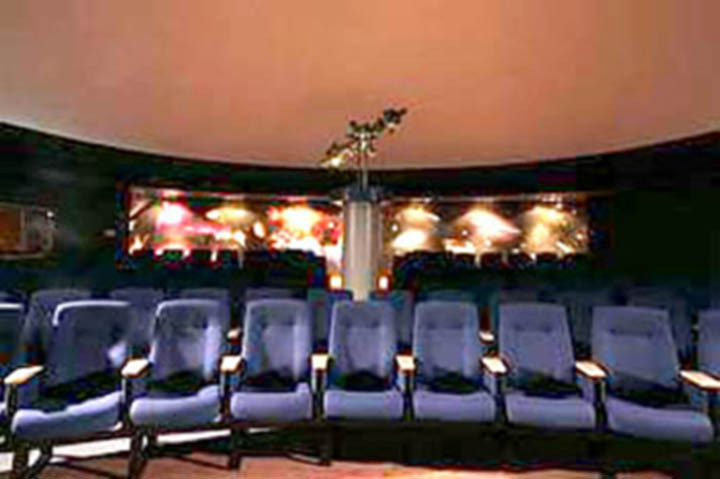 As part of their training, I arranged for an evening show at BYU’s Royden G. Derrick Planetarium. I can’t help but smile at the name – all they need to do is change the last name of Derrick to “Biv” and it would be the Roy G. Biv Planetarium. If you’re a physicist, it is funny. I talked with Dr. Jeannette Lawler, director of the planetarium, whom I had met previously (we used to ride the same bus to work). I reserved seats for the Wednesday, July 15 show and she asked Matt McNeff, who does most of the shows, to set up a screening of the “The Secret Lives of Stars” narrated by Patrick Stewart, as well as a star party with telescopes up on the observation deck after the show. As long as I was setting this up and it was on a Wednesday, I also invited along the Webelos Scouts that my wife and I are Den Leaders for. One of my student’s parents is also a Den Leader, show she invited her Webelos along as well. And while I was at it, we invited the other BYU-REUs to come. It wound up being quite a group by the time we put it together. 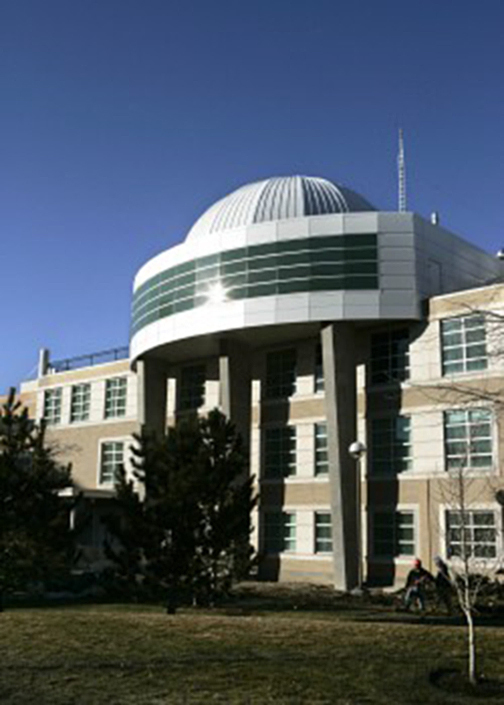 The Royden G. Derrick Planetarium at BYU as seen from outside. Matt did an excellent job leading us through the constellations and showing us some additional materials after the “Secret Lives” show. We had some time to kill because it was still light outside, so he showed us some other cool effects that the digital planetarium system can do. 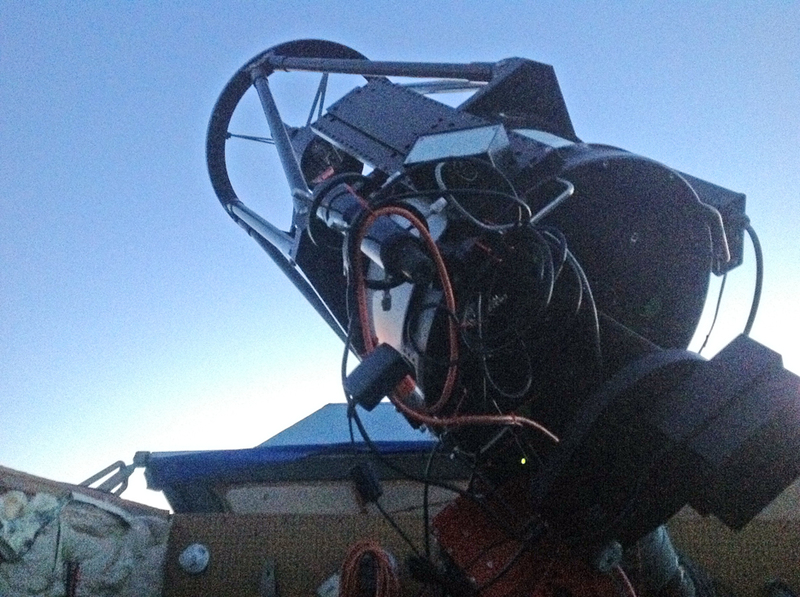 Then we got the telescopes set up, including two 12 inchers and an 8 inch scope. It was hazy from smoke from fires in western Utah so the seeing conditions weren’t the best, but we did get to see Saturn and Mars in Virgo as well as Albireo in Cygnus. This optical binary star has one component that is a rapidly rotating bluish Be star and the other a brighter yellow-orange star that is itself a physical binary. It is a popular target for stargazing. 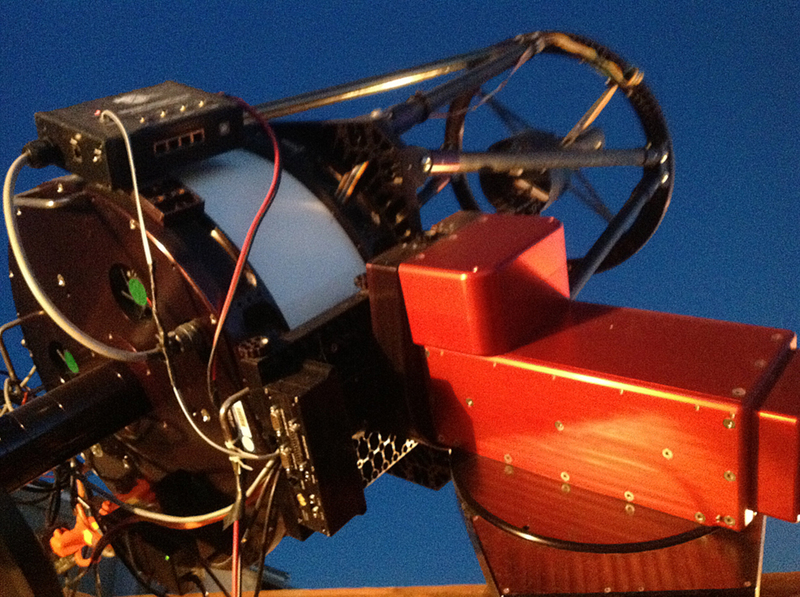 ROVOR – the Remote Observatory for Variable Object Research. It is located on the Theo Barry farm west of Delta, Utah. One thing I also want to do this summer is to learn how to take images with a telescope and actually do the data reduction myself. Getting up to the West Mountain Observatory may be difficult to arrange, given my schedule, but I did take the opportunity to go see ROVOR (the Remote Observatory for Variable Object Research), a remotely operated 16-inch telescope located west of Delta, Utah. Here is the website for it: http://rovor.byu.edu/. Dr. J. Ward Moody used grants to build this system, which can be controlled and operated from BYU. He took a group of us down on Tuesday, July 22 to change out some filters and to see how it works. Dr. Moody and I both graduated from Delta High School, although he is about five years older than I am. One of my best friends from high school (and my college roommate) was his younger brother, Reed. 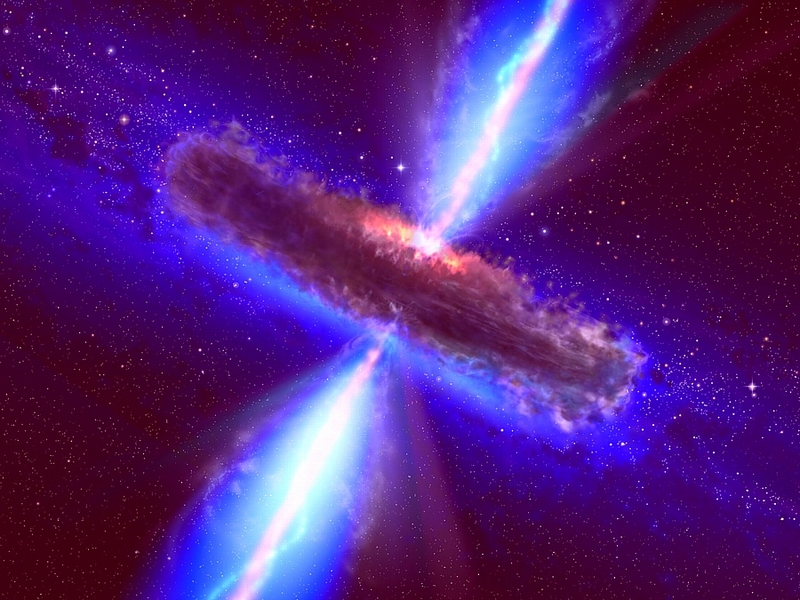 Artist’s depiction of a supermassive black hole, such as those at the heart of active galaxies. If we view along the jets emanating from the magnetic poles, the object appears as a blazar. On the way down, we all talked about current and future projects they hope to work on with ROVOR, including analyzing the optical light curves of blazars such as Markarian 501, detecting emission galaxies in intergalactic voids, and other projects that I’m not at liberty to discuss here. We ate at the Delta Freeze on the outskirts of Delta (same place I took my students to at the end of our Nevada field trip in May). Close up view of ROVOR. The large building houses the scope and is called the Dog House. The smaller building houses the computer system and communications uplink. It is called the Outhouse. When the mosquitoes come out, it can get quite tight in there . . .
Then we drove west out of Delta over the bridge to Sutherland and on to Abraham and Theo Barry’s farm, where ROVOR is located in a patch of greasewoods. 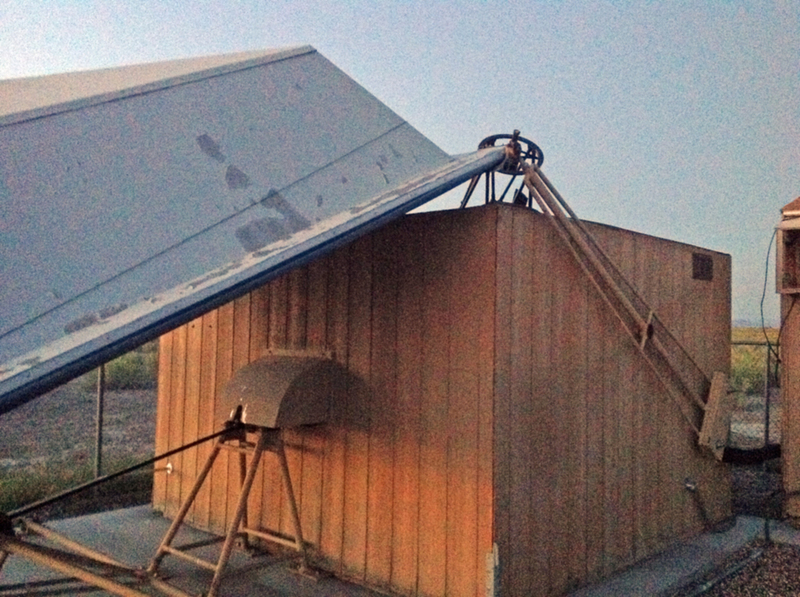 It is designed with a unique system for opening up the observatory. 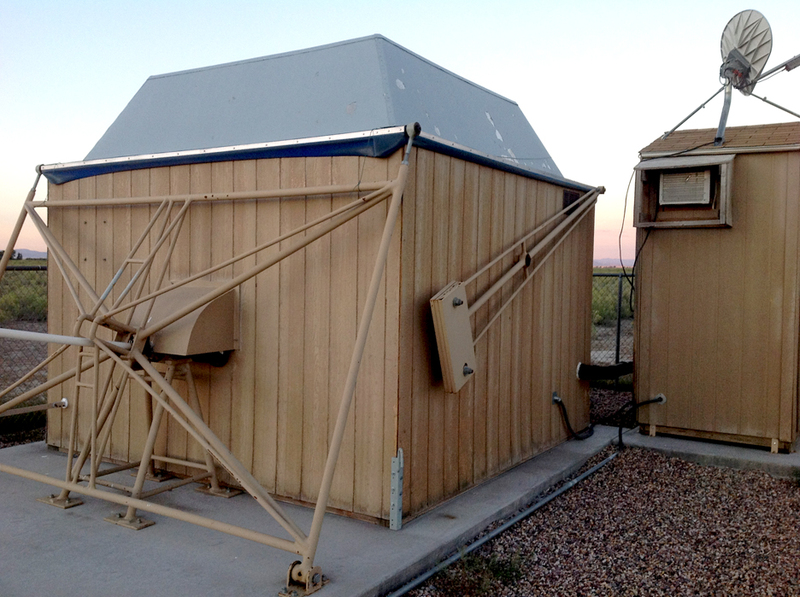 Instead of a dome that rotates with a slit for the telescope, or a roof that slides sideways, this system uses very simple system that doesn’t jam up or get dirty. A motor turns a screw that pulls hinged arms away from the building, and these arms along with counterweights lifts the roof up and sideways, kind like tipping a hat. Look at the photos shown here to see how it works. I took videos of it opening up. 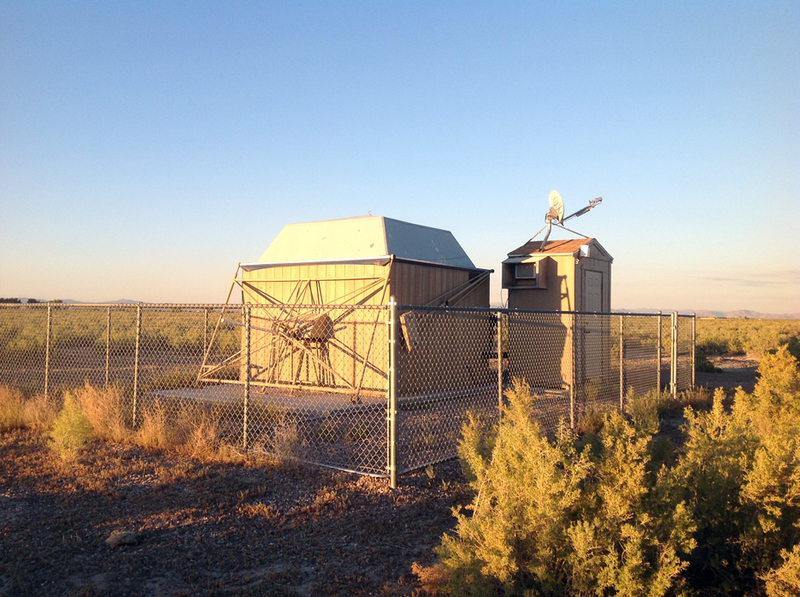 The main building houses the telescope and optics and a small side building (which looks kind of like an outhouse) houses the computer system and transmitter. Sunset over Lady Laird Peak in the Big Drum Mountains. The plume of smoke through which the sun is setting was coming from a wildfire beyond Swasey Peak. 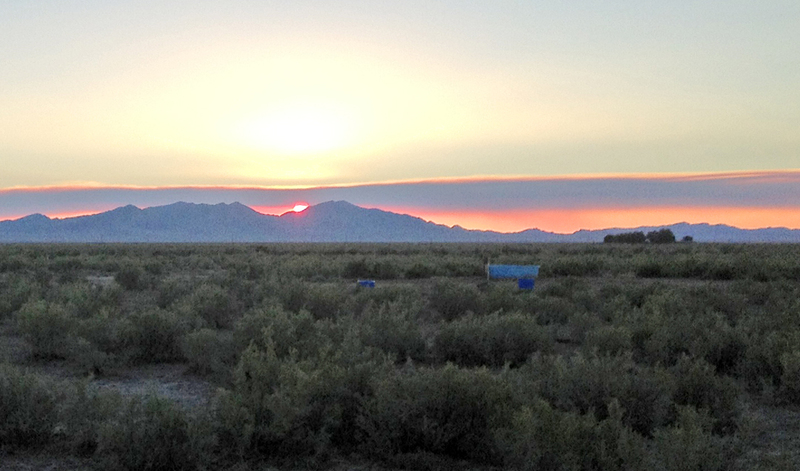 We got there at sunset, which was deep red because of a plume of smoke from a fire in Tule Valley beyond Swasey Peak. Then the mosquitoes started to attack. Having grown up around here, I’m used to them and don’t get welts, although I don’t like them sucking my blood any more than the next person. We had to hide out in the control outhouse until it was dark enough to open the roof. We had a great view of the night sky, dark enough to see the Milky Way. Several satellites orbited overhead, and Mars and Saturn were clearly visible in Virgo to the southwest. Antares blazed in Scorpio, and Vega moved into the zenith as the night progressed. Taking the “hat” off the dog house. It is a simple mechanism that extends a screw along the white pole while the roof hinges off with counter weights. It is like tipping a hat, and is much less prone to jamming than other types of observatory domes. At about 11:00, after testing the software and recording some flats, we returned to BYU. We saw deer and even a coyote on the way through Leamington Canyon, as well as several jackrabbits. Its good to see they are making a comeback. 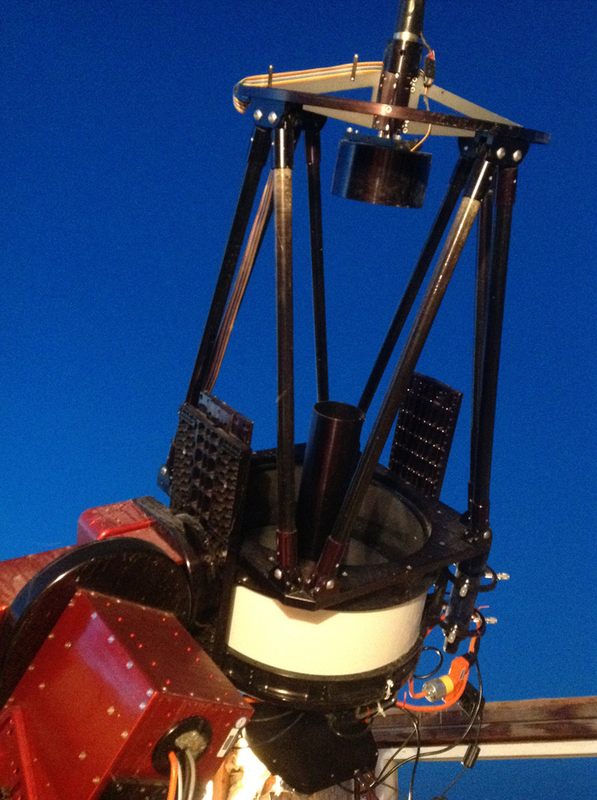 The 16 inch telescope that is part of ROVOR, with mount and electronics. 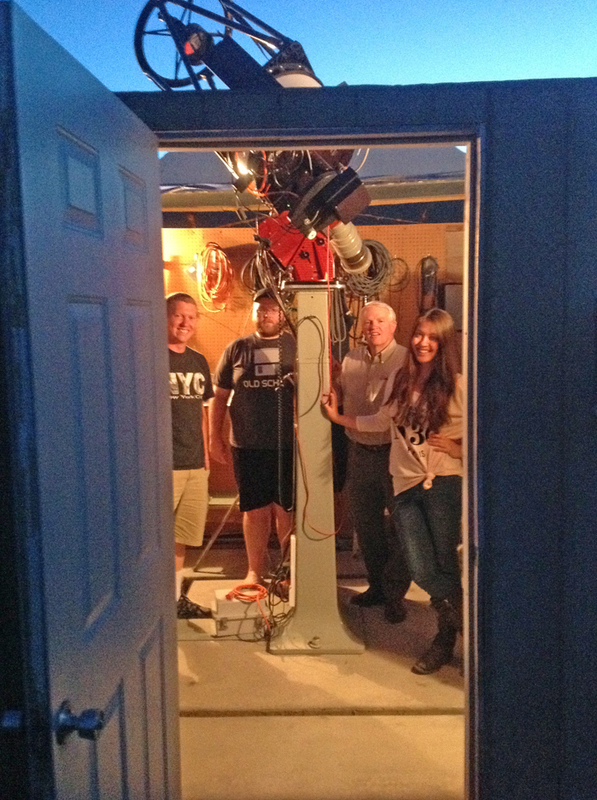 16 inch telescope at ROVOR in the west desert of Utah.